This is a really fascinating bit of research carried out by scientists looking into the body plan of snakes. They discover how a single DNA letter change, a C to a T, was able to have a tremendous impact in vertebrate evolution. You can read the full text paper published in the Proceedings of the National Academy of Sciences journal (yay for #OpenAccess!). • Hox genes are a group of related genes that control the body plan of animal embryos, from the head to the tail. These genes are so important in development that the DNA code is identical across many different species; if you take a hox gene from a fruit fly and line it up against the equivalent hox genes of humans and worms, it will align perfectly. Why? Because any random mutation in these genes (over the millions of years of evolution between humans and worms and fruit flies) would come with an evolutionary penalty, and therefore these gene sequences are strictly conserved. 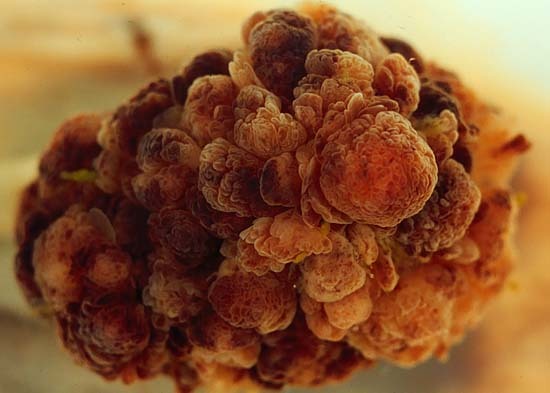 • When mutations in Hox genes do occur, the results are dramatic. 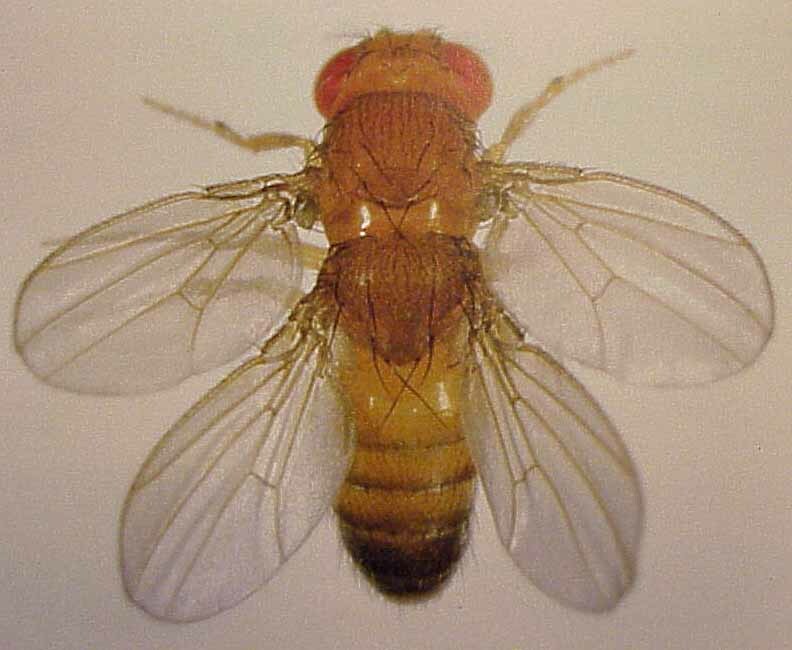 Most of the work on hox genes have been carried out on fruit flies. Mutating Hox genes produces flies with legs on their heads instead of antennae . Flies with double-sets of wings instead of just one pair. Clearly, having the correct hox gene active at the correct time, in the correct location is paramount to laying down the body plan in animal development. • Hox genes are transcription factors. This means they act as ‘master switches’, when activated go on to activate or repress other genes which in turn activate or repress other genes along a ‘signaling pathway’ that ultimately results in giving a ‘make antennae here’ or ‘here be wings’ signal to the body plan. • One such Hox gene, known as hox10 is expressed in areas that should not develop ribs; hox10 has rib-repressing activity. 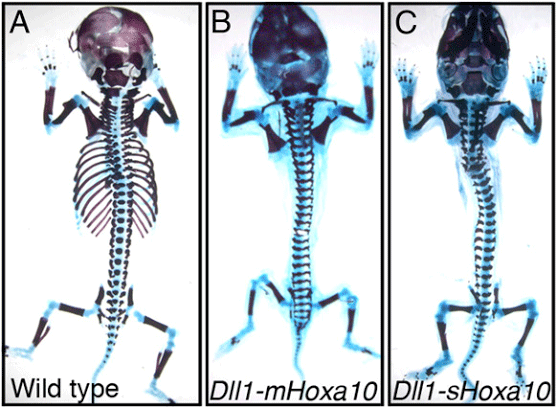 In humans and mice, in areas where hox10 is active, there are no ribs. So hox10 activity in the abdominal region is why we don’t have ribs that extend across our abdomen. • In snakes, the situation is intriguingly different. In areas where hox10 is active, you would typically expect to see no ribs; in snakes however, hox10 is active even in areas where there are ribs present. What does this mean? Why is hox10 unable to repress rib formation in snakes? • Scientists attempting to answer this question first took the snake hox10 gene and put it into mice. The resulting mouse embryos had normal development, apart from a lack of ribs, showing that snake hox10 still has the ability to block rib formation. So what was going on? • The scientists next looked at the genes that were activated by hox10, downstream of the signalling pathway. They found two genes, myf5 and myf6, that hox10 would bind to, to activate the rib-repressing program. They also discovered a region of DNA present in both these genes, known as an enhancer. This enhancer, known as H1, is the actual physical region of the DNA that hox10 binds to, to activate myf5 and myf6. So to recap, in the normal rib-repressing program, activated hox10 binds to the H1 enhancer of myf5 and myf6 genes. • In snakes, the story was different. They found that the H1 enhancer had a single DNA letter mutation that prevented hox10 from binding to it! This meant that even though snake hox10 still had the ability to repress rib formation, it couldn’t do that because it was unable to bind to its downstream target genes myf5 and myf6. • This single letter mutation, CCAATTG instead of CTAATTG, was found in all the snake species the researchers checked. Intriguingly, they also found this same mutation in manatees and elephants, species that also have extended rib cages. • What does this mean? 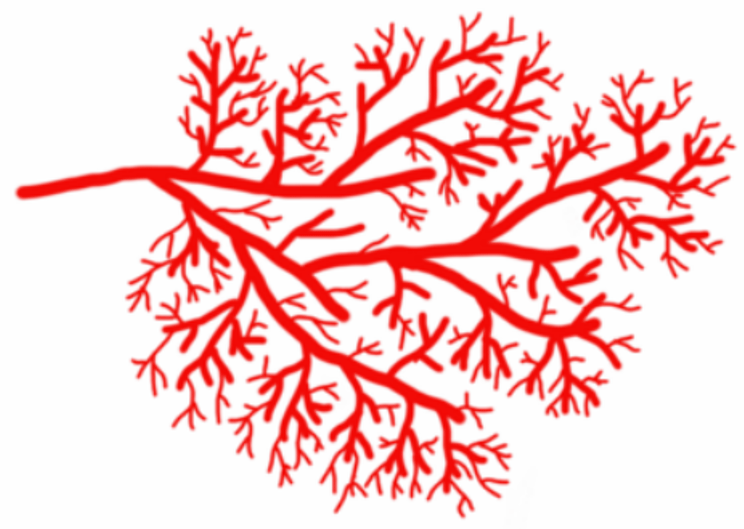 It means that a single letter change, from C to T, resulted in the evolution of extended rib-cages, and had a significant impact on the evolution of the vertebrate spine. When I first learned about Hox genes, I was amazed that a handful of genes could control so much. Finding out that just one tiny letter-change was all it took to build a completely different body plan was more evidence as to just how amazing Hox genes are!